Tablets still have some way to go before they are considered robust enough for full word processing tasks. But right now they are perfectly positioned as note-taking devices, especially given their inherent mobility. What sets note taking apps apart from word processors is the idea of speed, cross device compatibility (allowing you to access cloud-based notes via your smartphone, tablet or PC) and multimedia capabilities (allowing you to take notes via voice recordings, images and video). Apple’s App Store is brimming with note-taking apps, each one promising to organise your ideas more effectively than the other. But which ones are really worth taking note of? Here are our top five note taking apps for the iPad. Catch is an excellent little note taking app, with an intuitive interface across both your mobile devices and – importantly – via the desktop, cloud-based, platform. Catch basically does the same thing as Evernote, letting you jot down text-based notes, or record audio or images. The biggest difference is Catch’s Twitter-style hashtag feature, that lets you categorise notes across different projects. The app is free to use, but if you want more than five projects you have to sign-up to a monthly subscription. Evernote is the grand daddy of note-taking applications, having been around in the very early days of the iPhone. It’s evolved considerably since 2007/8, and now lets you take image notes, voice recordings and lots more. Evernote has also split recently into a number of different apps. Evernote Food is focused on recording food recipes and experiences, and Evernote people is like an enhanced contacts book, including information pulled from Facebook and Google Calendars. But the core Evernote note-taking app is as solid as ever. Google Docs is not specifically aimed at note taking. It still bills itself as a word processor. 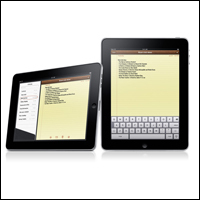 Nevertheless, it’s a really powerful note-taking app, giving you all the features and functionality of a word processor on your iPad. The great thing about Google Docs is its desktop utility, which is becoming more and more developed. This is especially useful if your company is using Google Docs as a replacement for Microsoft’s productivity suite. As Android becomes more popular with enterprises, expect Google Docs to become an more robust mobile platform. Fetchnote is a relative newcomer to the note-taking space. It’s a lightweight app that places a lot of emphasis on simplicity and speed. As such it doesn’t have the robust list of features of apps such as Evernote, but it makes up for this in elegance and ease-of-use. Fetch’s user interface simply consists of a plus button to start a new note and a hashtag to categorise the note. There’s no prioritisation just hashtags, which sort all your ideas into categories. The app also lets you push notes to other users by simply using an @username prefix – very Twitter-esque. If you’re looking for a really simple , barebones, note-taking app with social features then Fetchnotes is worth a try. Remarks is actually the only paid app on this list, but its £2.99 price tag is well worth it. Remarks is a handwriting note-taking app and therefore relies on you using an iPad stylus (unless you fancy writing with your finger). The app lets you create and edit documents, annotate PDFs, sketch out ideas, co-edit notes with friends and edit any notes on your PC or Mac. One of the key benefits of Remarks over other note-taking apps is the ability to annotate PDFs. This is a really useful feature for students, SMEs, or anyone that has to read through PDFs for work. You can also import and upload files to Dropbox. If you prefer to sketch out ideas and work with a stylus then Remarks is a great choice.